Last month I had the wonderful opportunity of doing an international rotation in Tanti, Argentina. Tanti is a small mountain town (population ~ 5,000) in the sierras in the province of Cordoba. The area, while slightly improved from the economic nadir of the 1990s, is still an underserved area of the country, with poverty's not discriminating - affecting people from all backgrounds, countries of origin, and walks of life. 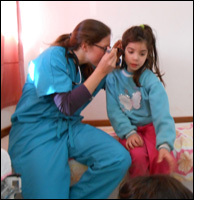 Although health care in Argentina is publicly available (as are all social services to all residents - regardless of immigration status) resources are limited especially in such rural areas of the country. Health care is improving, however, through the dedicated work of the dispensarios. Each day, I worked in the Dispensario de Tanti, a state-sponsored public health center for the community of Tanti and the residents in the surrounding mountains. The dispensario offered family medicine, pediatric, gynecological, psychiatric, and dental services to its patients. I assisted with well child checks, sick visits, adult medicine visits, and well adult exams, as well as helping to educate the local physicians and medical staff. In particular, I worked with a few physicians specifically about smoking cessation counseling and counseling on helmet use for motorcycles (smoking and motorcycle accidents are two major causes of morbidity and mortality!). In addition, I assisted the clinic staff and providers on plans for improving basic hygiene in the clinic. I learned a lot from this experience and am incredibly grateful for the support of the Benjamin H Josephson Fund! Thank you!